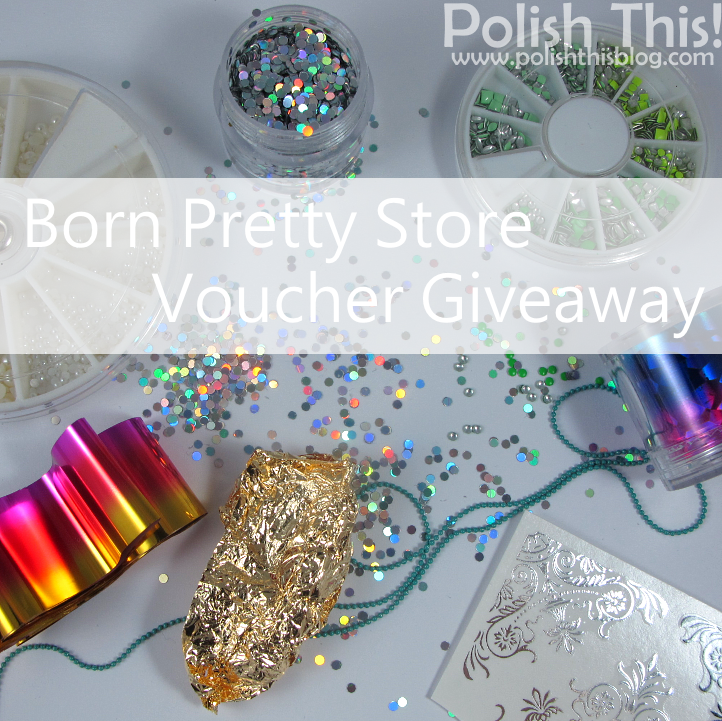 Born Pretty Store Gift Voucher Giveaway! - Polish This! As promised before, I have another little giveaway for you guys! One winner will receive $20 voucher to Born Pretty Store! I have done quite a few reviews of Born Pretty Store products, so I gathered some of my favorite products from the store to that giveaway picture. But of course if you win, you can choose what ever you want to buy with that $20 gift card. This giveaway is open internationally and BPS offers free shipping for everyone, so you don't have to worry about any shipping costs either. There's very very wide selection of nail art products and plenty of other stuff too in the store, so I'm sure you will find some nice products to buy with that voucher. The rules are really simple, all you need to do is to fill out that Rafflecopter form. There are two mandatory entries: you need to give me your email and you also have to follow Born Pretty Store blog, because this giveaway is sponsored by Born Pretty Store. All the other entries are voluntary, but you can get quite a few extra entries by following @Bornprettystorenailart on Instagram, my blog, me on Instagram, Polish This! Facebook page or by leaving some feedback. This giveaway ends 22 October and the winner will be chosen randomly. I will then email the winner and if the winner doesn't anwer within the next 48 hours, I will draw another winner. Great giveaway - love to enter but I don't have an Instagram account! I really liked your travel report, lol; other than that, I still very much like comparisons and your nail art. I like nail art posts and reviews. I have ordered from the born pretty store before and it took forever to get my stuff because it came from China. Your nail-art is fantastic! Have a nice day! I love cosmetic reviews, DIYs and tutorials! Thanks for giveaway! I like hauls and reviews posts! i like the nail art tutorials. i need pointers on how to keep my nails healthy and growing..right now the peel so bad ! Thank you for thiswonderful giveaway! You do so beautiful Nailart!